There’s something so magical about a Christmas tree -- the incandescent lights, the array of ornaments, and, of course, all of the presents underneath it. But what’s even more magical is when you cut down said tree all by yourself. Sure, it might be easier to go to one of the local lots, but trust us: Once you have that saw in your hand, you’ll be happy you’re going full Paul Bunyan. And don’t worry -- all of these farms have everything you need to chop down your tree, including the saw, measuring stick, and people to help you drag it, wrap it, and tie it on top of your car. Most of them also have a bunch of other stuff, like hay rides, petting zoos, and lots and lots of treats. There’s one thing and one thing only to do at this Christmas Tree Farm: cut down a Christmas tree. Choose from Douglas firs, Monterey pines, and Sierra redwoods, or get a pre-cut Noble fir (the royalty of Christmas trees). There are thousands of trees to choose from, and the setting is beautiful. Be sure to leave time for a leisurely walk through the woods. How far is it: About an hour from the middle of SF. Cost: $54.95 to $79.95, depending on variety. This four-acre farm has a Victorian farmhouse, whitewashed barn, meandering creek with bridges, and a miniature Christmas train village. Basically, it’s perfect for picking out a tree and getting that great Christmas card photo. You can pick out -- and cut down -- your own tree (the farm grows mostly Douglas firs, but there are also a few other varieties), or get a pre-cut Noble fir or Silvertip fir shipped fresh from Oregon. After the work is over, head to the wreath barn for complimentary hot chocolate and candy canes. How far is it: About an hour and a half from the middle of SF. Cut down your Christmas tree (mostly Douglas Firs), or get a fresh pre-cut Noble fir at this 12-acre farm. You’ll also want to take a tractor-pulled hayride with views of Mount St. Helena, the Geysers, and the Sonoma Mountains. 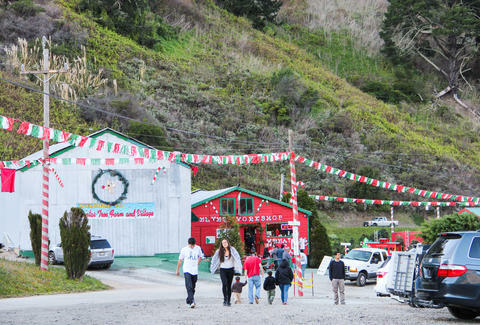 The 50-year-old Old Red Barn is where you’ll find Mrs. Claus’ Kitchen and selection of food for sale, including hot dogs with all the fixings, apple fritters, and hot apple cider. 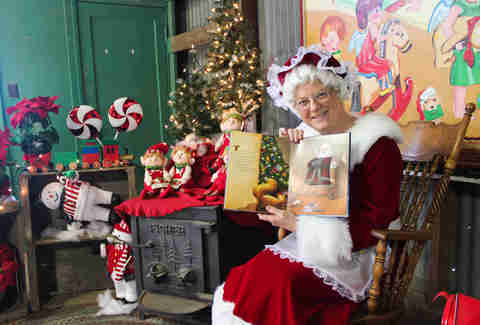 Of course, you must be sure to visit the farm animals at the petting zoo, and, on the weekends, listen to Mrs. Claus read stories. Side note: the popcorn at Mrs. Claus’ Kitchen is supposedly the best homemade popcorn on this side of the Sierras. Cost: Choose-and-cut trees average around $9 a foot, and Noble firs range anywhere from $21 to $150, depending on the size. You can choose and cut a Monterey pine, Sierra redwood, or a Leyland cypress Christmas tree, all of which are grown naturally -- without pesticides or chemicals -- at this farm in Petaluma. If you’re new to the whole cutting down a tree thing, there are Lumberjacks to help you with everything from chopping the tree, hauling and netting it, and loading it on your car. And if you’re set on a tree from the fir family, you can get those pre-cut. There’s also an animal corral with miniature donkeys, alpacas, pigs, goats, llamas, and a goose named Gandalf. Cost: $54.99 to cut your own tree, regardless of size. Pre-cut trees start at $50. Take a horse-drawn carriage ride for a tour of this 10-acre farm before chopping down your Christmas tree. Choose from Douglas fir, white fir, white spruce, Scotch pine and Monterey pine. After, there are plenty of activities for the kids, including a candy cane jump house, pony rides, visits with Santa on the weekend, and a petting zoo (for kids AND adults) with alpacas, miniature horses, sheep, and goats. There are also pre-cut Noble firs and locally baked treats for sale. How far is it: About an hour and 20 minutes from the middle of SF. Cost: Choose-and-cut trees are $7 to $11 per foot based on the variety of the tree. This Christmas tree farm is the place to go for anyone who can’t stand the huge plastic figurines and long lines at most farms and instead prefer a very Northern California Christmas tree farm experience. Think: a picnic area overlooking the ocean, a fire to roast marshmallows, wreath-making, tractor rides through the fields, so many swings, straw bales to climb on, and two enormous xylophones for playing Christmas carols (all free except the wreath-making). 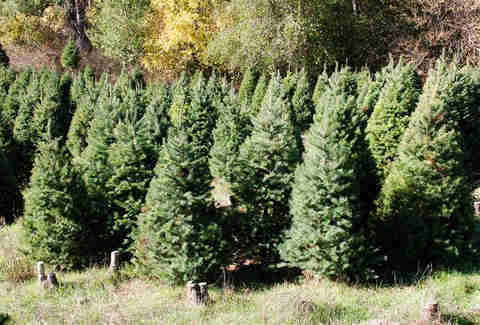 There are several types of choose-and-cut trees, as well as pre-cut Noble firs. 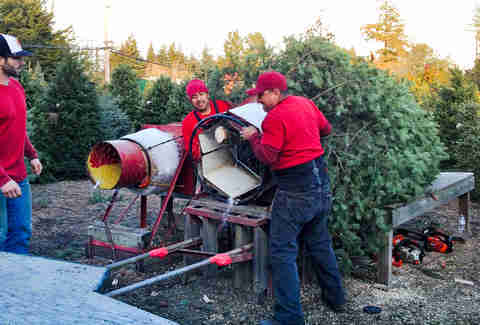 Cost: Most choose-and-cut trees are $75, and the pre-cut Noble firs average about $95. Train rides, and hayrides, and farm animals, oh my! Plan to spend a couple of hours at this Christmas tree farm because not only can you pick and cut your tree, but you can go on a tractor-pulled hayride, see goats and miniature ponies, take a train ride (if you’re a kid), sit on Santa’s lap (also only if you’re a kid, and only on the weekends), get hot dogs, treats, and lattes from the snack bar, and find plenty of places perfect for posing for pictures. There are a mix of trees available (all of which are marked with price tags), as well as measuring poles, tree carts, and people to help you with all of it. There’s also a selection of pre-cut Noble firs. Cost: Choose-and-cut trees are priced anywhere from $7 to $9 a foot based on variety and quality. 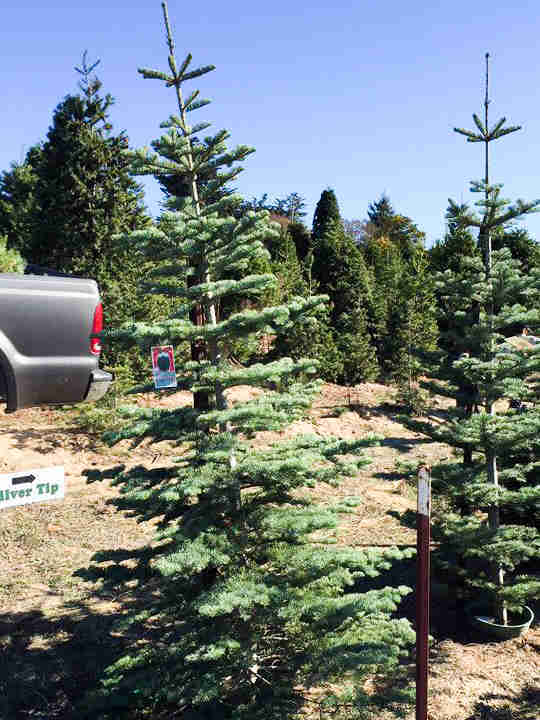 Pre-cut Noble firs range from $39 (four feet) to $104 (10 feet). If you like kitsch, you’ll love Santa’s Tree Farm where the activities (free and paid) kind of overshadow the reason you came in the first place. Visit Santa’s Village to see a puppet show, visit with Santa, play putt-putt with Rudolph, and listen to stories read by Mrs. Claus. 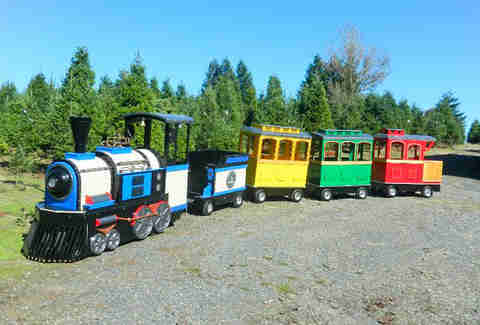 There are also train rides, carolers, and visits from Santa on the weekends. Oh, and trees. There are six different types you can chop down yourself, as well as a selection of pre-cut trees. And when you buy a tree, you get complimentary cider and candy canes. How far is it: About 45 minutes from the middle of SF. Cost: The average price for a choose-and-cut tree is between $59 and $76. OK, so this lot only has pre-cut trees, but it’s for such a good cause that we wanted to throw it in here. Plus, it’s in the city, and if you don’t have a car, they’ll deliver and set up your tree. They also have it all: trees, stands, ornaments, wreaths, garlands, and a disposal bag for when it’s time to haul the tree to the curb. But, most importantly, The Guardsmen Christmas Tree Lot is a San Francisco tradition. The organization has been selling trees with proceeds to benefit at-risk youth in the Bay Area since 1947, so you can feel good about going over your Christmas tree budget. How far is it: It’s in the Marina, so not too far depending on where you live in the city. Cost: Anywhere from $39 for a 2- to 4-foot tree to $1300 for a 22-foot tree. An 8- to 9-footer will run you $165 (plus $25 to $100 for a stand). Daisy Barringer is an SF-based writer for Thrillist. Follow her on Twitter @daisy.